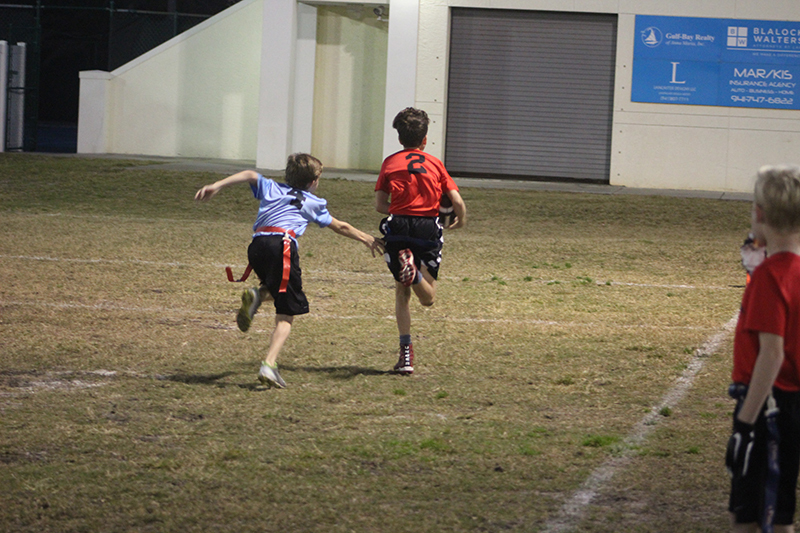 Blue Lagoon defender Matt Speidel chases down and pulls the flag of Jeremiah Sculco to prevent a Planet Stone touchdown during the flag football league’s 11-13 division championship game at the Center of Anna Maria Island. Planet Stone, 11-13 division champs. Coach Joe Christenson, Evan Christenson, Riley Quillin, Anthony Nguyen, Jeremiah Sculco, Grayson Mitchell, Dylan Jacques and Riley Lawson. 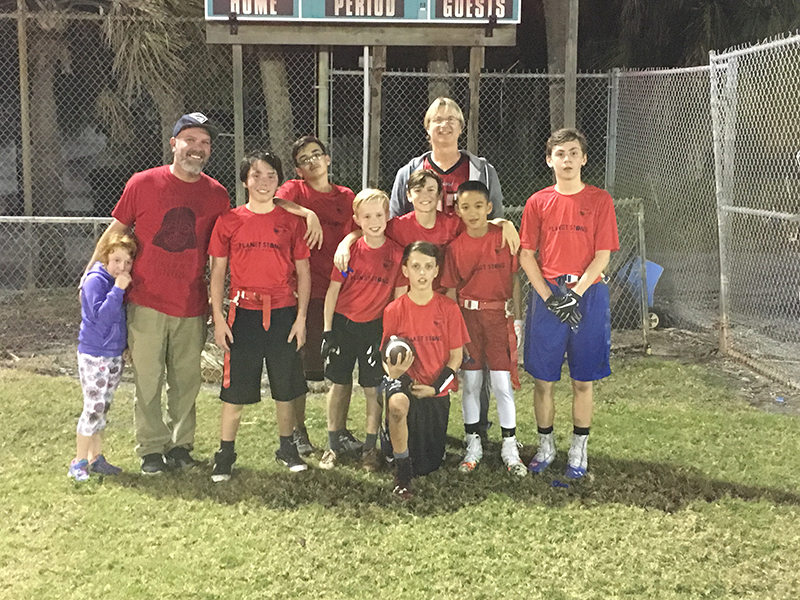 The youth flag football league at the Center of Anna Maria Island came to an end in two nights of action on the center field and the crowning of three division champions. The 11-13 division’s championship game Feb. 7 saw No. 1 seed Planet Stone taking on No. 2 seed Blue Lagoon. Planet Stone wasted no time getting on the scoreboard on its first possession. A 26-yard pass from Evan Christenson to Jeremiah Sculco gave Planet Stone the ball deep in Blue Lagoon territory, where Riley Quillin finished off the drive with a 6-yard touchdown run. Christenson then hit Quillin for the extra-point pass and a 7-0 lead. Blue Lagoon answered with a drive of its own. After two plays for minimal yardage, Kale Petrin connected with John Holbrook for 18 yards and a first down. Holbrook then connected with Tres Maddox for 6 yards before finding Sam Leister in the endzone for a 12-yard touchdown pass. Petrin hit Holbrook on the extra-point pass to tie the score at 7-7 with 4:39 left to play in the first half. Planet Stone responded quickly. Christenson found Quillin for a 9-yard swing pass before breaking out some razzle-dazzle on second down. A double reverse resulted in Riley “Dash” Lawson getting around the corner and outrunning everyone down the sideline for a 29-yard touchdown run. Petrin hit Holbrook to complete the extra point and take a 14-7 lead. Blue Lagoon went three and out on its next possession, giving Planet Stone the ball back with just under a minute left in the half. Christenson got loose for an 18-yard run on first down and then connected with Sculco for a seven-yard completion, giving them a first down. Sculco completed a 7-yard pass to Christenson on first down before Christenson connected with Sculco for an 11-yard touchdown pass and a 20-7 halftime lead. Unfortunately for Blue Lagoon, Planet Stone got the ball to start the second half and wasted little time in extending its lead. Christenson connected with Quillin on a short swing pass that Quillin turned into a 45-yard touchdown. Christenson then hit Anthony Nguyen for the extra point and a 27-7 lead. Blue Lagoon got the ball back and Petrin connected with Jiles Kirkland for 6 yards on first down and, after an incomplete pass, Petrin found Holbrook for 14 yards and a first down. David Patterson ran a sweep for 9 yards on first down and then took a lateral from Petrin to the right, before reversing field and outrunning everyone to the corner for an 11-yard touchdown. Petrin hit Holbrook for the extra point to pull to 27-14. Planet Stone took possession and Quillin gained 6 yards on a sweep before Lawson again put his blazing speed on display with a 26-yard run on a reverse. An incomplete and a false start penalty moved Planet Stone back 5 yards but, on third down, Christenson scrambled to keep the play alive before hitting Nguyen with a 10-yard touchdown pass. Christenson connected with Sculco to extend the lead to 34-14 with 8:24 left to play. Blue Lagoon got the ball back but, on first down, Sculco broke through to sack Holbrook in the end zone for a safety to extend the Planet Stone lead to 36-14 and get the ball back for the offense. Blue Lagoon and Planet Stone traded three and outs as the clock ticked down. Lagoon got the ball back with 50 seconds to play. Holbrook hit Petrin with a pass out to midfield before connecting with him again on a 26-yard touchdown pass as the clock ticked away, ending the game with the score 26-20 and Planet Stone on top of the world. Christenson threw three touchdown passes to lead Planet Stone, which also received two touchdowns and an extra point from Nguyen and touchdowns from Quillin and Lawson. Sculco added a touchdown reception, 2 extra points and added a sack for a safety in the victory. 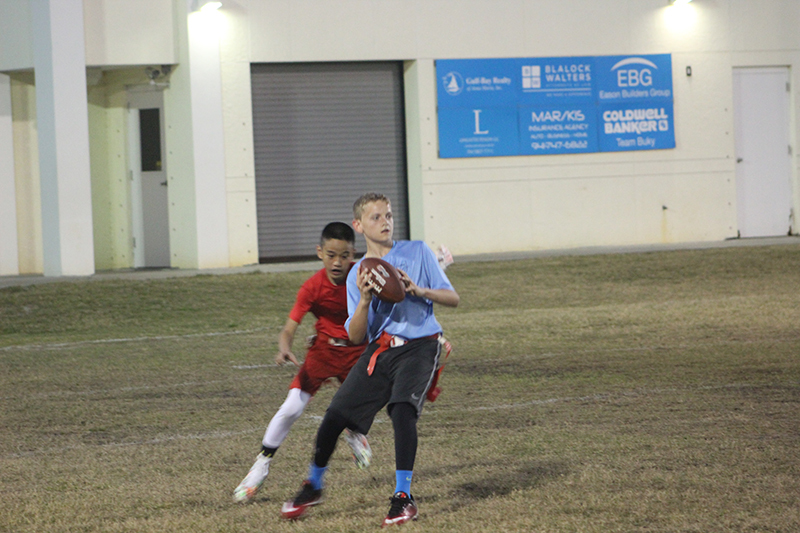 Holbrook had a touchdown catch and a touchdown pass to go along with a pair of extra points to lead Blue Lagoon, which also received a pair of touchdown passes and a touchdown reception from Petrin. Patterson completed the scoring for Blue Lagoon with a touchdown reception. Slim’s Place completed an undefeated season by rolling to a 51-26 victory over Blalock Walters to win the 14-17 division championship. The victory ends Slim’s season with an unblemished 8-0 record. Members of Slim’s Place are Connor Ludwig, Tuna McCracken, Jackson Runo, Nicholas Bigelow, Parker Davis and David Daigle. Monica Simpson coached. The 8-10 division championship game was played on Feb. 6 and saw No. 5 seed Cortez Pump roll to a 25-14 victory over No. 3 seed Bins Be Clean. Members of the 8-10 champs are JM Feeney, Frankie Coleman, Layla Yavalar, Colten Shook, Caden Quimby, Ava Harlan, Peyton Harlan and Krosby Lamison. Cortez Pump was coached by Gary Harlan. Once again rain plagued the men’s regular Monday Stableford match, but the course dried out in time for the women to play a nine-hole individual-low-net match Feb. 7. Judy Christensen fired a 4-under-par 28 to edge Phyllis Roe by a stroke to win Flight A. Sue Little and Joy Kaiser finished in a tie for third with matching 1-under-par 31s. Fran Barford’s 1-under-par 31 gave her first place in Flight B, one stroke ahead of Marcia Helgeson and Roxanne Koche, who tied for second place. Penny Williams and Gloria LaDue tied for third at 1-over-par 33. Janet Razze fired a 2-under-par 30 to grab a one-shot victory over second-place finisher Connie Livanos. Carol Duncan was alone in third with an even-par 32. Peggy Clauhs carded a 3-under-par 29 to grab first place in Flight D by a stroke over Markie Ksiazek. Jane Perkins and Susan Van Orsdel tied for third with matching 1-over-par 33s. The men played a nine-hole scramble Feb. 8 with 49 golfers participating. The team of Jim Auch, Peter Lund and Hoyt Miller matched the 4-under-par 28 carded by Tim Friesen, Nub Turner and Larry Pippel for a two-way tie for first place. The team of Gary Alfor, Gary Risner, Greg Shorten and Quentin Talbert tied the team of John Cassese, Gary Razze, Gary Silke and Debbie Wohlers with a score of 3-under-par 29. 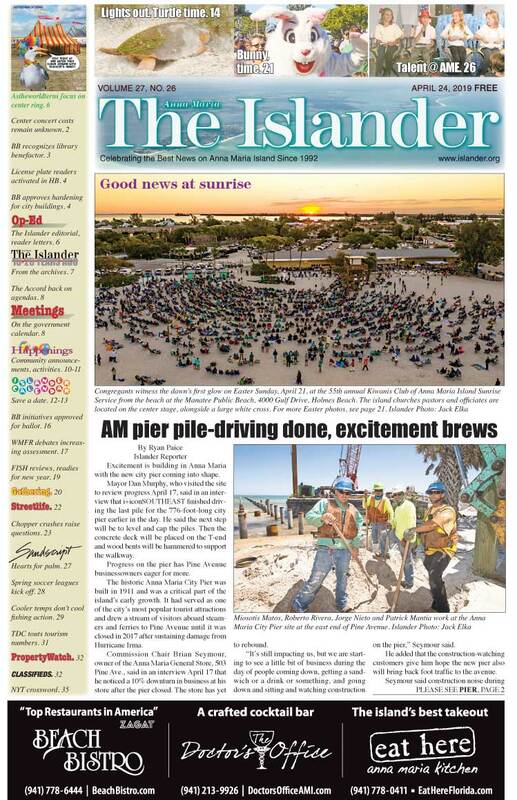 Four teams posted 3-0 records during Feb. 7 horseshoe action at the Anna Maria City Hall pits and battled it out for the day’s championship. The team of Bob Brown and Bob Lee eliminated Steve Hooper and Bill Fox 22-13 in the first semifinal, while Gene Bobeldyk and Bob Rowley defeated Bob Mason and Art Kingstad in the second semifinal. Bobeldyk and Rowley stayed hot and rolled to a 22-2 victory over Brown and Lee in the finals. Four teams also advanced to the knockout stage during Feb. 10 action. Fox and Mason rolled past Jay Disbrow and Myles Macleod 25-11 in the first semifinal match while Jim Kleiner and Rod Bussey advanced to the finals with a 21-13 victory over Dom Livedoti and Steve Smith. Kleiner and Bussey earned the day’s bragging rights thanks to a 21-6 victory over Fox and Mason in the finals.